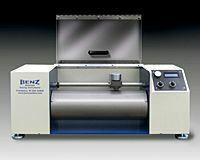 Benz services and calibrates every instrument we sell, as well as most major manufacturers' models. 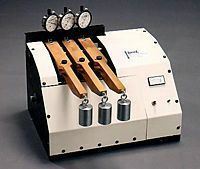 The new Benz DIN Abrader accurately and consistently measures the abrasion resistance of cured rubber compounds, enabling quality control engineers, purchasing agents and researchers to compare and verify the durability of rubber compounds. The Benz DIN Abrader offers companies verification of materials abrasion durability, which is crucial for insuring quality, comparing suppliers and verifying claims. The Benz DIN Abrader removes rubber from a 16 mm (5/8") diameter sample. It allows the abrasion of compounds up to 40 m (36.6 yds.) long, using pretreated sandpaper in an unusual method that prevents the paper from becoming clogged with rubber residue. The amount of pressure applied to the compound can be adjusted in 5 Newton increments, up to 20 Newtons, showing the effect on the compound of different abrasion pressures.